Hello once again all potential vessels of the Lord of Plague! 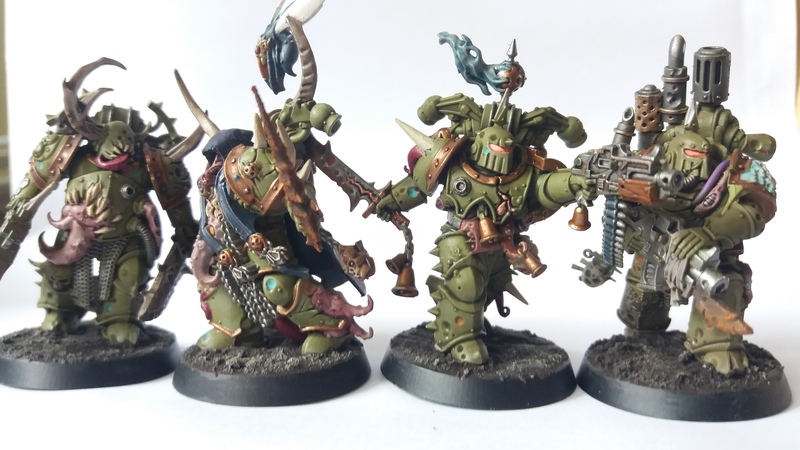 Today I bring you the final snapshot into the Death Guard segment of the Dark Imperium box set. If you somehow missed them you the previous ones then please feel free to gander at Part I and Part II. This being the third and final part will show the last two units within the box. Let us first peruse the particularly vile and unpleasant-looking psyker of the group; the aptly named Malignant Plaguecaster. This guy’s prime job as psyker is to support his fellow plague-ridden and/or to weaken those who oppose you. His various abilities can include skills that decrease statistics of units that it targets or even the chance to shroud friendly squads, making them difficult to hit. Likely you’ll want to use this on your Poxwalkers to get them further up the field before being cut down by enemy fire. The model is quite striking thanks to the stream of fly-slick vomit/pestilence given form/something equally disgusting. This gives the model a nice little bit of an unusual silhouette which helps it stand out amidst your fleet of Death Guard. Stick it atop a 40K Hero Base as above and it only helps to make it all the more imposing. 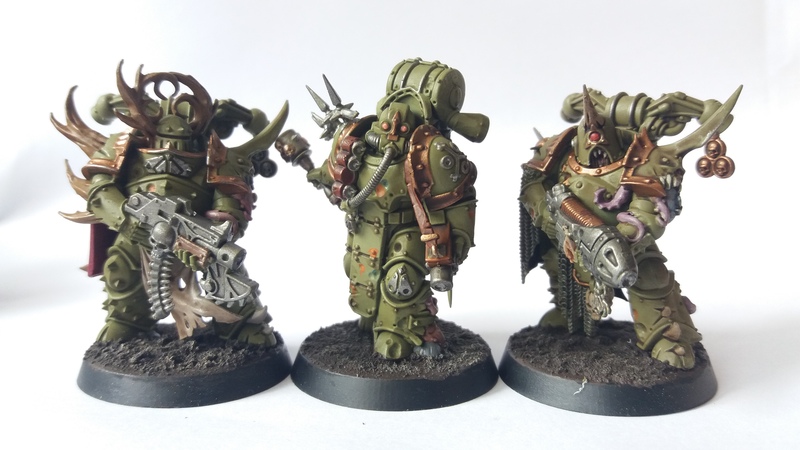 Finally, what felt fitting to finish on this series, is the core of the Death Guard infantry – the Plague Marines. Forming the main frontline of most Death Guard armies, the Plague Marines are renowned for being able to take damage just as good as they can dish it out. They are a strong and versatile unit with a wide range of weapons available. They have increased versatility in that their squad size can be quite varied; they can come in numbers of 5, 7, 10, 15 and 20! Quality and quantity are both strong options here, especially if you can combine them with some transports to get them where they need to be. Each Plague Marine model oozes (some cases literally) personality and detail to levels I struggled to comprehend when putting them together. The sheer amount of maggots hiding in crevices, fly iconography dangling with tentacles and cabling. Even the old style heresy-era bolters helped to really bring these models in to their own. If you manage to get your hand on some of these guys definitely take your time. I have a feeling I’ll be going back to these models for touch-ups and refinements for some time to help make them the best they can be due to their almost overwhelming level of detail. How are you finding the Dark Imperium box set? Have you managed to complete the Death Guard yet? Or maybe you’re more of a Primaris player. Please let us know via your comments as we’d love to see them! Thanks as always for reading. You can stay up to date with us here at TabletopGamesUK via our Facebook page and if you should to support us and our content you can do so via our Patreon page here.